Welcome to My Paris! Join me for an armchair tour of exquisite Parisian pâtisseries, chocolate shops, confiseries, tea shops – and now my ongoing list of Top Paris Tea Salons (by arrondissement). I’m not just mad about macarons: you’ll also find articles below on visits in and around Paris – and now, as ambassador for our region of les Yvelines just west of Paris along the Seine, I do hope you’ll venture out of the city to discover many hidden discoveries in the ‘haven of the Impressionists’, away from the tourist crowds. Alas, I no longer have the time to lead my chocolate/pastry walks in Paris with Context Travel but many of my favourite addresses and stories are cited along with pastry and macaron recipes for a self-guided pastry tour in my 2nd book, Teatime in Paris. 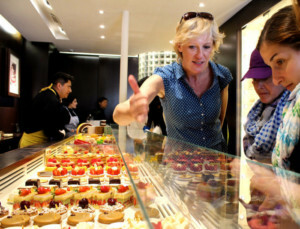 Looking for Paris Food Tours? Le Marais Paris Food Tour (The Paris Guy). 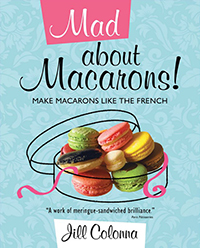 Simply use the code, MadAboutMacarons to receive 5% off all Paris tours. Macaron Day Paris 2018 – Plan your Visit! What are Your Best Macarons in Paris? A Walk up French Bread Street or Chocolate Street? Couldn’t have asked for a more enthusiastic, engaging and knowledgeable docent than Jill Colonna! A carefully crafted story, likely akin to the careful planning required for successful baking. Jut the right amount of history to ground the tasty tour in French history. Despite pouring rain, none of us even noticed for the tour was so engaging. A real treat for anyone whom has ever enjoyed dessert (like everyone!). Photos from the tour sent back to friends evoked longing and likely travel plans for Paris. Jill’s enthusiasm for the subject made the walk successful. She was knowledgeable, informative and entertaining. We thoroughly enjoyed the afternoon.